Recently there has been a lot of discussion about bullying, specifically at schools. As an early child care professional completing your early childhood training, you may be wondering if this is a topic worth exploring. The answer is a definite yes. If you plan to work with children, you need to understand bullying and how to address it in your classroom. Unfortunately, bullying is very common. According to some studies, nearly 20 percent of children face some type of bullying while going to school. This includes preschool ages as well. The early childhood classroom is not immune from bullying behavior. 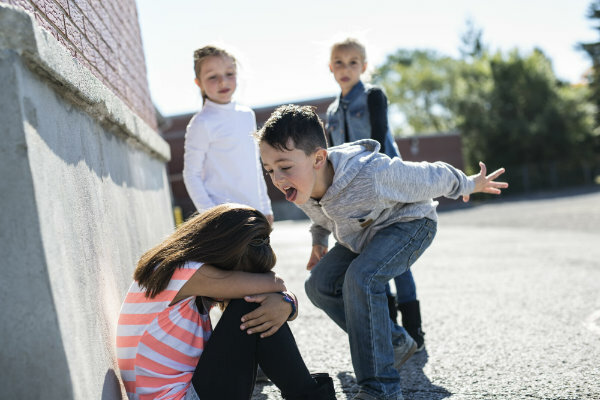 As children move from parallel play into playing together, and their social network and interaction with their peers grows, occurrences such as bullying can start to happen. Are There Early Childhood Training Courses on Bullying? To help you be prepared to address bullying behaviors in the classroom, there are early childhood online training courses focused on positive guidance, behavior management, and more specifically, on bullying. ProSolutions Training offers the course “Bullying Basics: Recognizing Bullying Behaviors and Risk Factors”. This course is one hour long and worth 0.10 continuing education credits. It teaches you how to prevent and deal with bullying behaviors in the classroom. Once you’ve completed that course, another great resource to try might be “Strategies for Preventing and Addressing Bullying Behaviors”. In this follow-up course, you learn what bullying is and how to spot it. You also learn how to prevent bullying behavior in your classroom and how to spot the signs or risk factors of potential bullying even before it starts. What Are the Risks of Bullying? Many people think of bullying as a one-way street, where one person causes harm and another person gets hurt. However, bullying has negative effects on all the people involved. In some cases, the bully is being bullied or abused in another setting, such as at home, and takes their experiences out on others. In other cases, the bully is afraid of social interactions and is resorting to bullying behaviors as an attempt to impress others and fit in. Unfortunately, if this behavior is left unchecked, both the bully and the victim may carry these behaviors into their future relationships. During the critical preschool years, children develop relationship patterns they carry into their future lives. As an educator, you want to help your students establish the healthiest paths possible. How Can You Prevent Bullying in the Classroom? To start, let children know you are available and aware of what is going on in the classroom. It's imperative that teachers are aware of children’s social interactions at all times, even if teachers do not intervene at every moment. Ideally, you want to establish trust with children to create an environment where they feel safe enough to share experiences or behaviors that make them uncomfortable, such as being witness to or experiencing bullying behaviors. Often, bullies try to scare their victims into silence so making it known you are a safe and comforting adult in their life can make all the difference. In addition, establishing positive communication with the parents of your children also creates a safe space for parents to share their concerns or news should they hear anything. Sometimes, however, it may become necessary to take charge of some social interactions. For instance, you may want to assign groups or use seating charts so that your students don't always choose who to work with or where to sit. Those kinds of dynamics can sometimes end up regularly leaving out some children and creating social hierarchies in the classroom. For more tips and ideas, check out the trainings mentioned previously and gain more knowledge on how to deal with bullying in the classroom. If you're doing your early childhood training, make it easy by going to school online. At ProSolutions Training, we have everything you need to earn or renew your CDA. Contact us today to learn more.